Nokia has silently been releasing some pretty nifty phones. And just like the others, it looks like the N82 might join the Nokia ranks as one very nice phone. It features a 320 x 240 TFT display, 5.0-megapixel camera, built-in WiFi and Bluetooth with A2DP support. Although that’s all I’ve got for you at this point, look for the N82 to make a big splash when it hits stores in the fourth quarter, all those details are sketchy at this point. Just sit back and stare at how small a phone with a 5-megapixel camera can be. 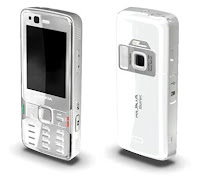 S60 3rd Edition Feature Pack 1, WiFi, 16 Million color 320 x 240 screen, 3G 2100 MHz, Bluetooth with A2DP support, GPS, TV Out, 5 megapixel Carl Zeiss lens with a Xenon flash! Expected to launch 4Q 2007. Dimensions: 112 x 50.2 x 17.3 mm with a weight of 120 grams.